Now that our school system has started a BYOT program, I have had teachers inquire about using Twitter as a communication tool. Currently, it is blocked and it’s impossible to filter Twitter’s content. So, what other options to teachers have, especially teachers with younger students? Edmodo? It’s a wonderful tool, but it’s design and function aren’t suited for open streams of conversation. So, enter Twiducate. 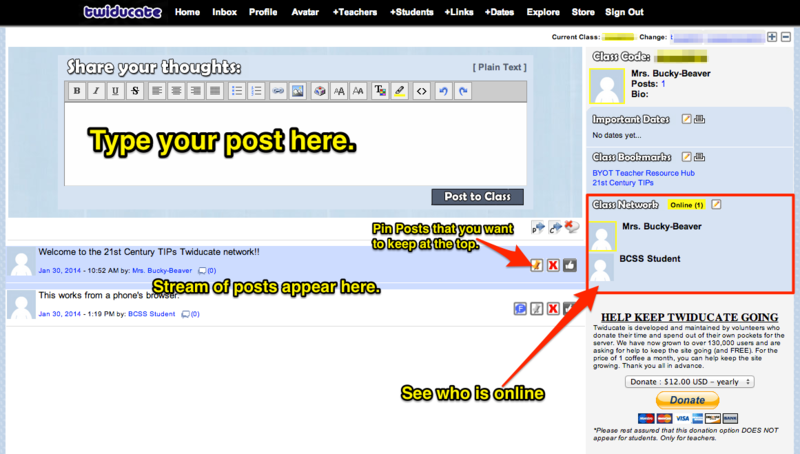 It’s a free social networking tool for schools, which allows teachers to set up virtual classrooms for their students. Like Edmodo, each Twiducate class is private and acts like a “walled garden”. You, the teacher, has control over who enters the class. The sign up and class set up process is easy. What may take the longest is establishing your list of students and their passwords. Twiducate will work on any device through a web browser by going to http://m.twiducate.com. The interface both on a web page and in a mobile browser doesn’t have a polished look like other sites, but it is functional for students. How do I Integrate Twiducate? Here are just a few ideas for how Twiducate could be used in the classroom. Video/Documentary: Post questions about the video’s content while students are watching. Use Twiducate as a “back channel” for answering and discussion, pausing the video as needed. Collaborative Writing: Provide the first sentence of a story and each student then adds a single line. Ticket-Out-the-Door: Post a question asking student to summarize what they’ve learned in the lesson. Key Concept/Vocabulary Words: Post a word and ask student to post their definition. Students can then vote on the best definition using the like buttons next to posts. Spelling/Grammar: Write a short paragraph or sentence with deliberate grammatical and spelling errors. Ask students to correct it for you. The first step is establishing your account and setting up your first class. 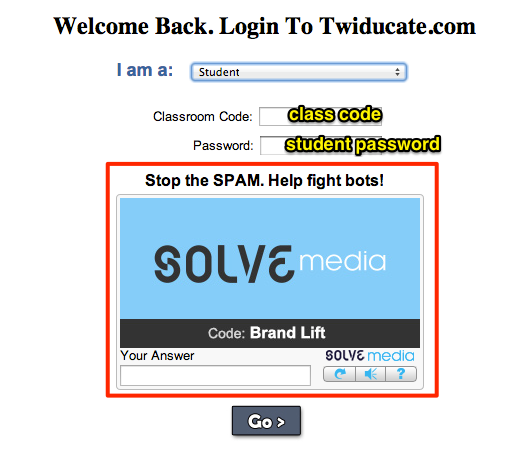 Go to Twiducate.com and click Sign Up, then complete the form below. 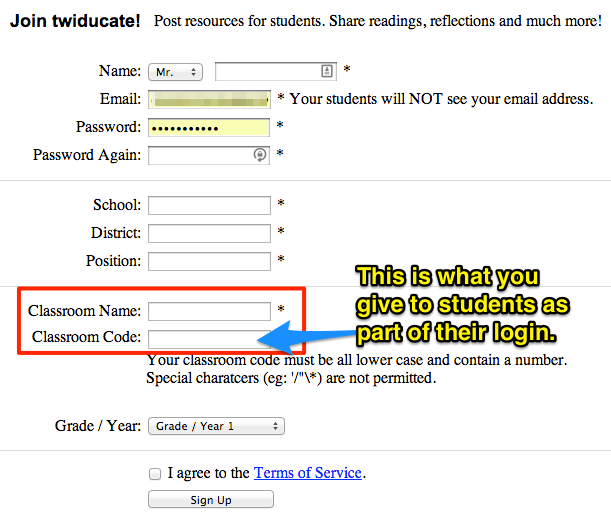 Notice that you will choose a Class Code, which is PART of what students will need to login. You will create their “accounts” and passwords once you’ve submitted this form. This is perhaps the one piece that I really don’t like, but as with any FREE site, they do look for means of support. The ads are ONLY on the login page and are integrated into their anti-spam feature of the sign-in. You will also see a request for donations after the login, but no ads. Once you’re logged in, you are taken straight to the dashboard where you can immediately create a post, see the stream of posts, add bookmarks and important dates for the class, and see who in your class is currently online. 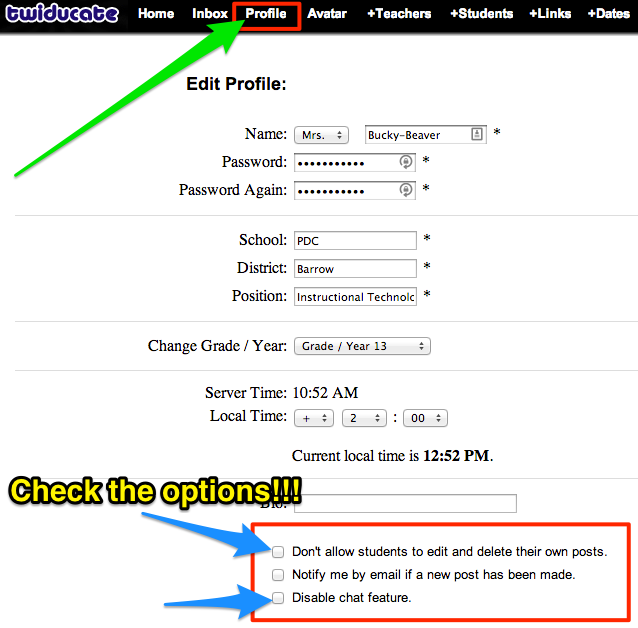 Before you add students to your class, click on the Profile link at the top of the page to change some of the class settings, such as the ability for students to instant message each other and to edit and delete their posts. Be sure to save your changes. Now that you have made those changes, click on the +Students link at the top of the page. Even though the class is private, you may only wish to use the student’s first name and last initial. Doing so demonstrates to students how they can protect their own identity by not creating profile names that use their entire name. Although the system will create a default password, change this to their student ID number, since all students know what this is.